In November, the Philadelphia Museum of Art will be presenting a new exhibition titled Little Ladies: Victorian Fashion Dolls and the Feminine Ideal. It features four gorgeous Victorian dolls and their equally gorgeous Victorian wardrobes. The dolls—known as Miss Fanchon, Miss G. Townsend, Miss French Mary, and Marie Antoinette—were all made in France during the 1860s and 1870s. They have painted bisque heads, leather bodies, and measure between 18 and 22 inches in height. 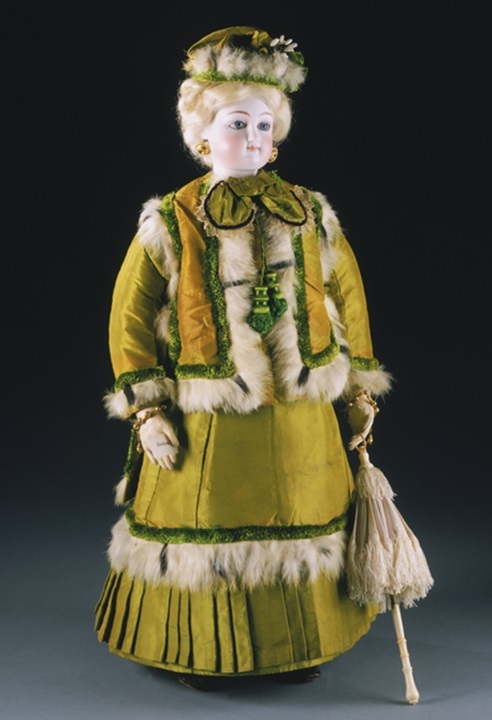 The Philadelphia Museum of Art calls them “the ultimate toy for privileged girls of this period.” But these dolls were much more than mere toys. They were models of perfect Victorian womanhood. “Miss French Mary” Fashion Doll, around 1875, France. Gift of Mrs. James Wilson Wister, née Elizabeth Bayard Dunn, 1970-215-1a. 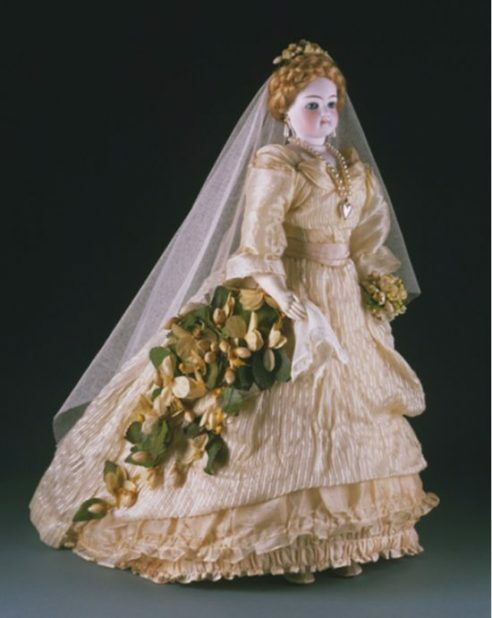 “Miss Fanchon” Fashion Doll, around 1870, France. Gift of Gardner H. Nicholas in memory of Mrs. Gardner H. Nicholas, 1922-58-1a. 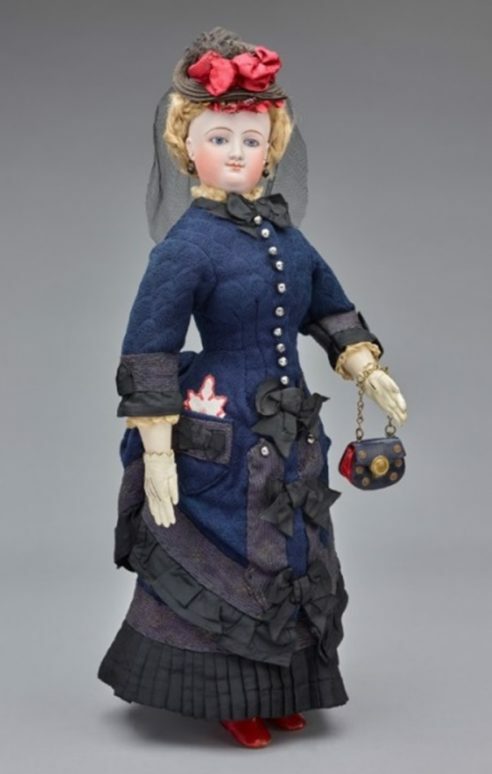 “Miss G. Townsend” Fashion Doll, 1870s, France. Gift of Edward Starr, Jr., 1976-58-9. To that end, the dolls’ clothing and accessories in the Little Ladies exhibit are intricate, miniature versions of those worn by fashionable ladies of the day. There are dresses for every occasion, as well as a full range of undergarments, outerwear, bonnets, jewelry, fans, and footwear. Each piece is remarkably detailed. For example, Miss Fanchon’s two-inch gloves have all the features of full-size gloves, including gussets and button closures. Miss Fanchon’s Gloves, late 1860s-1870s, France. Gift of Gardner H. Nicholas in memory of Mrs. Gardner H. Nicholas, 1922-58-109a,b. Doll’s Handbag, late 1860s-1870s, France. Gift of Mrs. William Hill Steeble and Martha B. Newkirk in memory of their mother, Mrs. I. Roberts Newkirk, 1977-189-4aa. In addition to clothing and accessories, the dolls also come equipped with a plethora of diverse personal items. There are toothbrushes, combs, books, visiting cards, a sewing kit, and even roller skates. Doll’s Sewing Equipment, late 1860s-1870s, France. Gift of Edward Starr, Jr., 1976-58- 9Ah1-7 and Gift of Mrs. William Hill Steeble and Martha B. Newkirk in memory of their mother, Mrs. I. Roberts Newkirk, 1977-189-4y. Miss Fanchon’s Roller Skates, late 1860s-1870s, France. Gift of Gardner H. Nicholas in memory of Mrs. Gardner H. Nicholas, 1922-58-80a,b. The exhibit will run from November 11, 2018—March 3, 2019. For tickets, or for more information, please contact the Philadelphia Museum of Art. *Author’s Note: I was fortunate to receive a press release and press image bank for this exhibit. Marcus, Sharon. Between Women: Friendship, Desire, and Marriage in Victorian England. Princeton: Princeton University Press, 2007. Cousin Nelly. Dolly’s Outfit: Teaching Children How to Dress Their Dolls. London: Samuel Miller, 1872. West, John. Maidenhood and Motherhood, or, Ten Phases of Woman’s Life. Chicago: Law, King, & Law, 1887. Now I know more about the doll I picked up in a junk shop in my teens, she had a broken neck saddle, so she wasn’t expensive! You’re lucky to have found one! I enjoyed your article. I would love to see the dolls. I hope the exhibit goes on tour. Thank you. 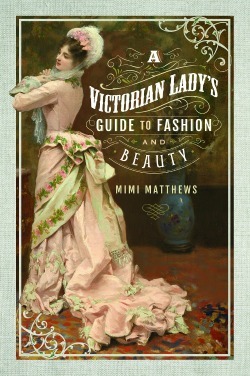 I do like learning about the Victorian era. I will take advantage of your hard work and buy your books. Even the Title’s are fun. Those miniature accessories are incredible! I wish I could go to this exhibit, but your article is the next best thing. Thank you for bringing this amazing exhibit to our attention! Thank you Mimi, I love this article. My sister and I had many dolls but none as exquisite as these. What a treat to see them and their accessories – I agree with the other commenters – I would love to see them in person but you have given me the next best thing through your article. And of course I own all of your books and enjoy them immensely! Wow, those little roller skates are fantastic! Everything’s cuter when it’s tiny!